Barricade | Pro Chem, Inc. This catalyzed aliphatic polyurethane coating dries to a tough, clear, protective, UV-resistant barrier that makes the removal of graffiti easy without affecting the appearance the surface it is applied to. 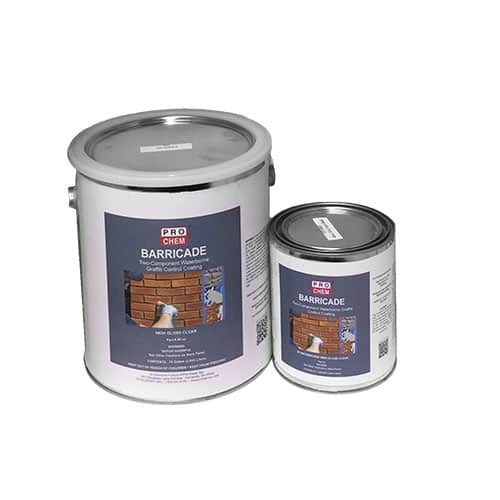 BARRICADE is an easy-to-use product that is environmentally friendly with zero VOC (Volatile Organic Compounds), zero HAP (Hazardous Air Pollutants) and very low odor. It exhibits outstanding hardness and adhesion and excellent abrasion, chemical, solvent and UV resistance. Mix Part A thoroughly. Then add the full contents of Part B to Part A and blend completely (2-3 minutes). A drill-mounted impeller is recommended for best mixing. Apply when air and surface temperatures are 50-90°F and the relative humidity is less than 85%. Do not apply if rain is expected within 48 hours of application. A minimum of two coats are required at the recommended spreading rate. Do not exceed the spreading rate as this may cause pinholes, microblistering or a milky appearance. If over 12 hours lapses between coats, lightly scruff sand the surface and remove all dust before applying the next coat. For proper performance, the finish must be a uniform, continuous film with no pinholes or other defects.